Hawaii is a group of tropical islands on Earth, and is one of the fifty states of the United States of America. Hawaii is visited in The Adventures of Super Mario Bros. 3 episode "Reign Storm". Princess Toadstool needs a break from her duty in the Mushroom Kingdom, and is ordered to go on vacation by her doctor, along with Toad. While Princess Toadstool is in Hawaii, she meets up with a surfer dude named Cutter, who quickly becomes her friend, and offers to give her surfing lessons. Along with surfing lessons, Princess Toadstool also goes swimming, windsurfing, waterskiing and hangliding. While Princess Toadstool is away in Hawaii, Bowser and Kooky von Koopa try to take over the Mushroom Kingdom by using a Robot Princess in her absence. However, Toad notices Kooky spying on them from behind some bushes, and so he and Toadstool know that something is up, and quickly return home. Before she leaves, however, Princess Toadstool thanks Cutter for the wonderful time she had with him, and tells him that one day she can make him feel welcome in her world, although Cutter just thinks she was crazy. Hawaii, along with its capital Honolulu, also appear in Mario is Missing! on the Globulator, the game's world map. Hawaii is briefly mentioned in Dinosaur Dilemma. 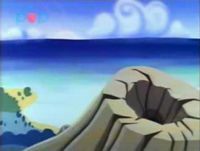 After Mario finds 300 Coins in an alcove, he exclaims that he has enough coins to "take a whole herd of cattle on a vacation to Hawaii". In the Club Nintendo comic "Super Mario in Aloha Hawaii", Mario and Bottles go on a vacation to Hawaii. In The Super Mario Bros. Super Show! episode, "Koopa Klaus", the Mario Bros. attempt to visit a land of Mushroom World named Hawaii Land, but Toad instead leads them to the North Pole. This page was last edited on April 10, 2019, at 20:09.